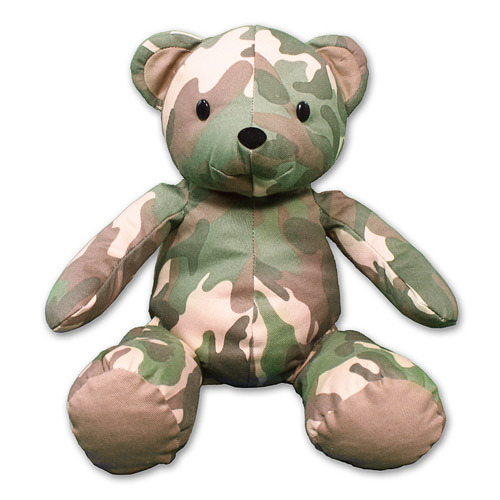 Feel Better Soon Teddy Bear - 12"
This Camo Teddy Bear is great for anyone feeling a little under the weather. Brighten up someone's day when you present this handsome teddy bear who sends well wishes. This heartwarming design is featured on our "My Hero Wears Camo" Teddy Bear. This handsome Bear measures 12" tall. He wears desert camouflage made of canvas and is surface washable. Free personalization of any design and any custom message is included on the t-shirt. Free Gift Wrapping and a Free Gift Card are included to create a thoughtful presentation. My Hero Wears Camo Bear - 12"
Salute your favorite hero with this special teddy bear all geared up in camo! 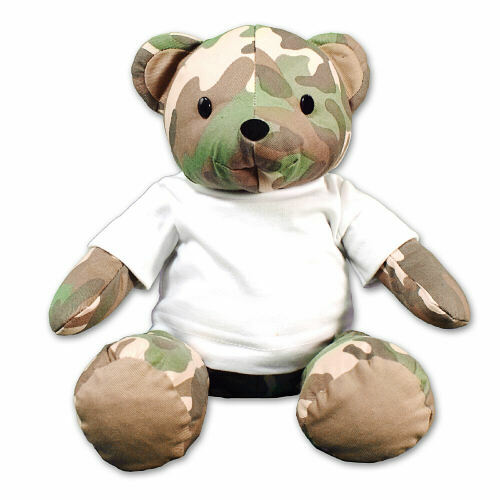 “My Hero Wears Camo” Teddy Bear is a great gift for all servicemen and women as well as their families. It is a wonderful way to honor and pay tribute to all who serve in the US Armed services. This handsome Bear measures 12" tall. He wears desert camouflage made of canvas and is surface washable. Free personalization of any design and any custom message is included on the t-shirt. Free Gift Wrapping and a Free Gift Card are included to create a thoughtful presentation. Additional Details 800Bear.com offers a wonderful collection of Get Well Plush Animals. Our loving collection is just the pick-me-up your friends and family need when feeling a little under the weather. You'll also fall in love with our Feel Better Soon Elmo Doll & our We Miss You Plush Teddy Bear as well.